At the time, this was considered a very controversial statement, and he got in some trouble for it. Stoffers sentiment comes during a period where industry was facing a unique problem. 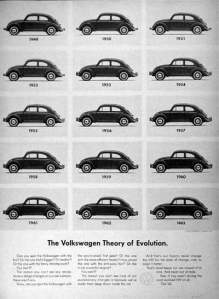 The Volkswagen theory of evolution left was to build something to last, without versions, fashions, and make it easy to fix. So when someone bought it, that was it. They only needed one. With this mode of production, markets were saturating. The opportunities for growth and profit were diminishing and reaching stability. Companies and industries that wanted to grow, that were premised on growth and profit started to intervene at a material level and developed disposability—planned obsolescence and fashion supported by a regime of advertising. They designed a throw away society. People bucked against this design. They had just come out of the Depression in the United States, and an ethos of saving, fixing, and stewardship was the norm. Industry was designing a shift in values.In his 1960 book The Wastemakers, Vance Packard writes against this sort of strategy for profit.He images a city called Cornucopia City, “located on the edge of a cliff, and the ends of [the] assembly lines can be swung to the front or rear doors depending upon the public demand for the product being produced. When demand is slack, the end of the assembly line will be swung to the rear door and the output of refrigerators or other products will drop out of sight and go directly to their graveyard without first overwhelming the consumer market” Packard 1960: 4. Even earlier, Susan Strausser recounts riots by soldiers in train stations in the 1917 when the communal tin cup for water was replaced with disposable paper cups Strasser 1999: 177. Such waste was seen as abhorrent.Seven years after Lloyd Stoffer’s controversial statement, he addresses plastics industry representatives at a conference in New York City: “It is a measure of your progress in packaging in the last seven years that this remark will no longer raise any eye-brows. You are filling the trash cans, the rubbish dumps and the incinerators with literally billions of plastics bottles, plastics jugs, plastics tubes, blisters and skin packs, plastics bags and films and sheet packages–and now, even plastics cans. The happy day has arrived when nobody any longer considers the plastics package too good to throw away.” Wasting has been naturalized. Disposables have been naturalized. via Waste as Profit & Alternative Economies | Discard Studies. Researchers have established that inhaling burnt plastic materials have altered sexual characters of some birds (from male to female). They have also revealed the same defects can easily occur in human beings. Plastics should never be burnt in the open air, there are recycling options available for disposal of these waste products. Thank you Internet for providing a daily dose of stupid. By contrast, modern mobile phones, which may contain up to sixty useful and rare metals, are too small and fiddly for triage to be worth the effort. The upshot is that many valuable materials end up in landfills or are melted into new metallic alloys, wasting their unique properties. If products were designed to facilitate proper separation and recycling of the constituent parts we could have a shot at creating sustainable cycles of raw-material use. As it stands, these materials get mixed and thrown away and even where it’s possible to re-use the economic incentive is not necessarily there because of prohibitive costs (again poor design…).